The Defence Forces Canoe Polo Competition is back for 2018!!!! 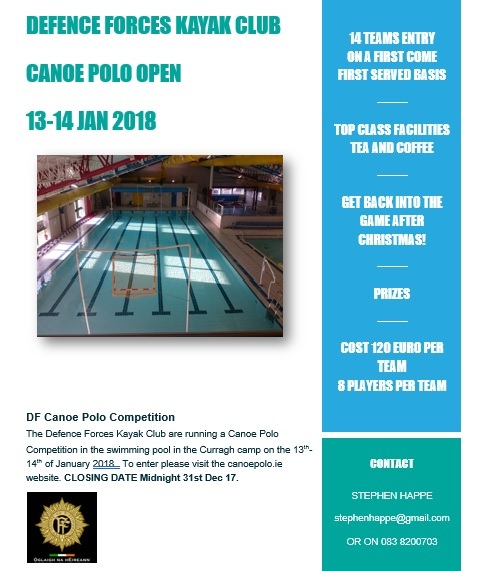 The Competition will be on the 13th-14th of January in the Curragh Camp Swimming Polo. Please visit the below link for all the information and to enter. “As part of our fund raising this year, Irish Men’s Canoe Polo Squad have entered Version 1’s Community Trust Grant scheme. This is a vote based competition for a 5K grant that will go towards equipment, uniforms, travel and subsistence for our 2017 European Canoe Championship Campaign. You will be taken to Version 1’s Facebook page where you can vote for our entry directly, and see a promotional video of a squad training session! Teams at Under 12, 14, 16 and 19 participated. It was well attended with teams from Istolong, Belfast, Wild Water Kayak Club, Kilkenny, Galway and Kilcock attending. This will be placed the Polo documents so that we can share it for the Polo AGM. Trying to get a notice out to them today.